If you have a gym nearby, do consider joining one. If you have never been to a gym, it may seem daunting at first, but you will find that most gyms are very friendly towards beginners and offer support to guide you through the start of your fitness regime. You will have access to a wide range of fitness equipment, exercise classes and professional advice and support. Monthly payments for gyms can range from about £25 a month to over £100, depending on the area and the level of membership you require. Most gyms will have a discount system in place if you are willing to commit for 12 months or longer – this is probably a good idea in terms of keeping up your motivation. There are often other discounted options, such as off-peak membership that allows you to come during daytime. Many people try to fit in their workouts before or after work, or during lunchtimes. These are the busiest times, and sometimes you may need to wait for equipment, so if you have the opportunity to attend off-peak, it would definitely be advisable. One of the biggest advantages of going to the gym is access to fitness professionals – every gym employs qualified instructors and trainers who can provide advice and coaching. Typically, you will get your first induction session free with membership. 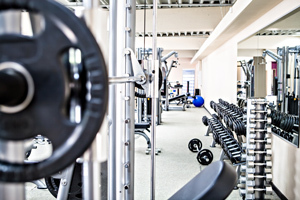 Gym staff should always be prepared to answer your questions about any equipment or to show you the correct technique. Some gyms also help you develop your first personalised programme for free. Another option available at many gyms is getting a personal trainer. The fee usually starts from £35 per hour, so it is quite expensive. However, you do get the benefit of professional advice that’s focussed on you individually. If you can afford it, several sessions with a personal trainer is a great way to start your fitness programme and learn the correct technique. Personal trainers can help you to develop your own personalised fitness plan, and usually also offer nutrition advice. Gyms host regular classes for groups of people. These can be free for members, and available to non-members for an additional fee, starting from £5 per session or so. Some gyms also offer a range of health-related services, such as health check-ups, consultations and physiotherapy, although it is likely that you will be charged for this separately. You might also find a range of spa facilities available, such as saunas, steam rooms or jacuzzis. There might also be massage therapists and beauty specialists working on premises.